Chez Reynella is about to start our Christmas holidays. We will be swiming, lounging, eating Christmas pudding, playing beach cricket and an assortment of board games. And not going anywhere near a computer for around two weeks. So this site will be quiet for a while. Here's wishing you all a Merry Christmas (or your local equivalent of SunReturnFestival) and a Happy New Year. Hope your holidays are great! See you in 2007. In the meantime, look out for Christmas ISS passes, and enjoy the glorious sky. The January Issue of Southern Skywatch is up now. It's up early as due to the Christmas Holdiays I will be doing Christmassy family things wth the Bettdeckererschnappender Weisle and the Boys. I doubt I will even see the computer in the next two weeks, but I do expect top see lots of Christmas pudding and roast meats of divers sorts. Anyway, coming up is a nice encounter of Saturn with the Moon, Mars amoung the Nebula, and a possible January comet. Somewhere in the murk and haze is Jupiter, Alderbaran and Mars. Oh well. (Click to enlarge image) That's it, that little bright dot just above the roof just slightly off centre. That's Venus. 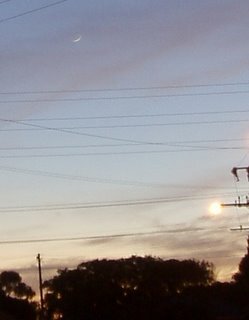 Weather and other issues (like meetings and putting kids to bed) have stopped me from seeing Venus in thepst few days, now that it is (just) high enough above the western horizon to see. Morning Moon with added planets. The eastern horizon on the morning of Tuesday, 19 December just half an hour before sunrise. Click to enlarge. 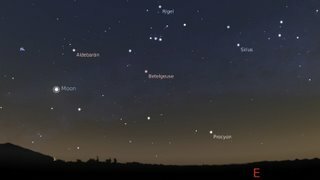 Over the next few days, if you are up early in the morning (possibly looking for meteors or aurora), you can see the crescent Moon edhe closer tho Jupiter and Mars. On the morning of the 19th, the Moon, Mars, Antares and Jupiter make a nice triangle. So, yesterday we had a massive geomagnetic storm which lasted for hours. Unfortunatey, for Australia it was during the day. Here's the Space Weather gallery of aurora from yesterday, and another set of nice aurora shots from Dennis Persyk. Sunspot 930 spat out another X class flare, so be alert for aurora this weekend. The coronal mass ejection for this event was not directly aimed at Earth, so any geomagnetic storm won't be as big as yesterdays. 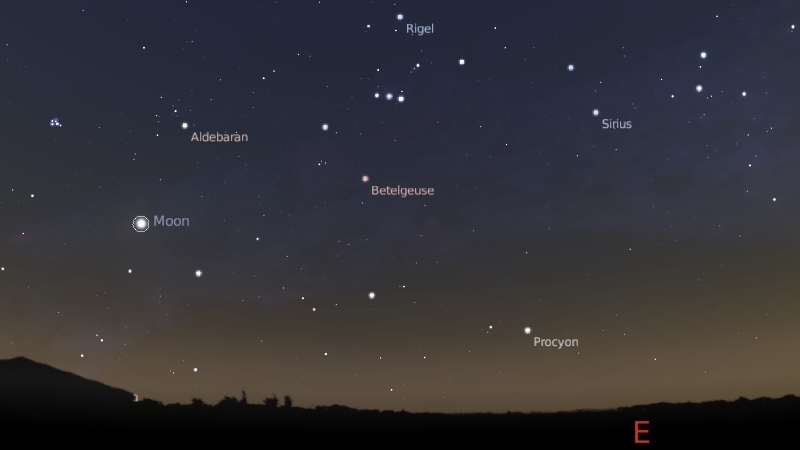 Over at ABC Online Science is Kathy Graham's guide to the Summer Sky. I was one of the people interviewed for this piece, and I drw them a couple of maps. Pop over and have a look! After seeing the sky covered wall to wall in cloud, I was not enthusiatic about getting up. Indeed, I only got up because SmallestOne kicked me awake. Satggering out into the early morning, I found there was a big hole in the cloud to the North, roughly Bounded by Saturn, Sirius and the Pleiades. While blinking stupidly at this, a sporadic meteor flashed past, so I wrapped a blanket around myself and sat down to watch. I saw 9 Geminids and 2 sproadic meteors in about 40 minutes. One was a bright beauty that shot past Orion, there was also a nice one that went past the Hyades. The ones I saw were all fairly bright, but most had fairly short flights. Then the cloud came up over the north again and I went in. Haven't seen any other reports yet. Update: Reports are in from the Americas and Hawaii. They got some good rates over there, ranging from 30-90 meteors/hour. Somewhat less than predicted, but a good show all round. A gallery of images is here. Voting is still open for the Weblog awards for best Science Blog. Voting closes Friday, and you can vote every 24 hours. Currently the Bad Astronomer andPZ Myers' Pharyngula are in a neck and neck race for first spot, while the Pandas Thumb (which I write for occasionally) languishes in third place. There is currently some light hearted competition between BA and PZ over the benefits of spines vs cephalopods (PZ has a thing for cephalopods) as they vie for top spot. They are now offering site badges as an incententive for voting. You can choose a BA badge or a cephalopod bage. Me, I say vote for who you think is the best science blog. Why not give Deltoid the once over, it also by a fellow Australian. Yes, there was a coronal mass ejection. See this animation from Space Weather. We should expect the CME to hit late today or early tomorrow. 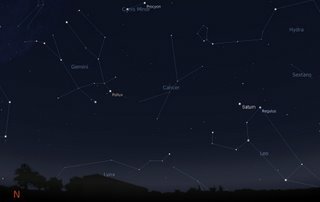 So people should add looking for aurora to their Geminid watch. 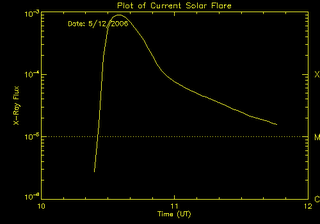 Well, no sooner had I said that Sunspot 930 has gone quiet, than it unleased an X 3.4 solar flare almost directly at us. The images are from the C3 camera before and after the proton storm from the flare hit SOHO. We don't know yet if there was a coronal mass ejection, but given past events, it is highly likely that one is headed our way. So be prepared for aurora on the night of Thursday the 14th and morning of Friday the 15th. These are also the times that the Geminid meteor shower is on, so an aurora watch and meteor watch could be combined. The areas most likely to see aurora are Tasmania, Southern New Zealand and Southern Victoria. Unfortunately, Southern Victoria and Tasmania are also battling savage bushfires, so folks there will likely be a bit preoccupied with other matters (sheesh! check the Google Earth KZM file of the fires! This will be one exhausting Christmas for many people). Let's include them in our thoughts and wish them respite. This also means that visibility is limited over most of Victoria by smoke from the fires. 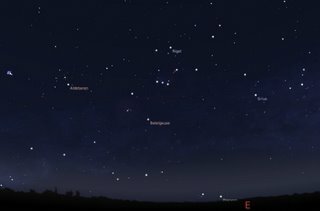 The northeastern sky as seen at 2:00 am (daylight saving time) in the Southern Hemisphere. Click the image to enlarge it. The radiant of the Geminids is just below Castor (the unlabeled bright twin to Pollux in the image). The Geminids have maximum rate of 120 meteors per hour this year. We won't see that many as 1) the peak occurs at around 10:00 pm AEST, and the radiant, where the meteors appear to originate from, doesn't rise until around 11:00 pm 2) In Australia, the radiant never gets close to the Zenith, so the murk of the atmosphere reduces the number of meteors we see. Nonetheless, we should expect to see around a meteor every one to two minutes after midnight. The best time to observe is between midnight on the 14th to around 2-3 am on the 15th. If you watch a bit earlier you may see the occasional meteor shooting up above the horizon. Even though it is summer, it is best to rug up warmly, as the early morning can be quite chilly. Having a chair or lawn lounge to sit on also makes life much easier. Face in the general direction of Gemini, but let your eyes wander over a fair part of the northern sky. The radiant is below Castor, but the meteors can start glowing a fair distance away. Do remember to be patient. If you wander out and look for five minutes then say "I didn't see any meteors" and wander back in again, the chances are your eyes had still not adapted to the dark. Also, remember that the meteors don't turn up evenly spaced, so you may have come out in a lull. As well, the sight of the milky way, Orion, Saturn, the Beehive cluster and Leo will be well worth and early morning vigil. Coming back home in the train today, late due to a committee meeting that ran over time (and ran over the afternoon drinks session the DVC (Research) had put on to thank our committee for the work they had done), I looked idly out the window and was attracted to a patch of colour. Since the windows of Transadelaide trains have weathered to a sort of frosted glass translucency, the colour had to be bright to catch my attention. Once I got on the platform I could see it was a Tangent Arc to the right of the Sun. It was very intensely coloured and quite bright. Above the Sun was a small arc, and then further above that a much broader arc. As I walked home the cloud that was responsible for the arcs drifted across the Sun. The right hand side dimmed and the broad arc became more intense and the colours more distinct. STEREO, the Solar TErrestrial Relations Observatory, is a pair of spacecraft that will provide 3D measurements of the Sun. They have been zapping around the Earth and Moon building uop momentum to get into theri final orbits, and tonight they make their final perihelion pass of the Earth. Unforntunately, the brightest they get is around 9th magnitude, so you wuill need a telescope to see them. This site gives info on how to observe the satellites as they swing aroun dthe Earth. Well, it was wall to wall cloud this morning. No sight of either Jupiter, Mercury and Mars or Venus, the Moon and Regulus. On the other hand, the fire risk is reduced, although many fires are still burning out of control. So spare a thought today for those battling the bushfires. 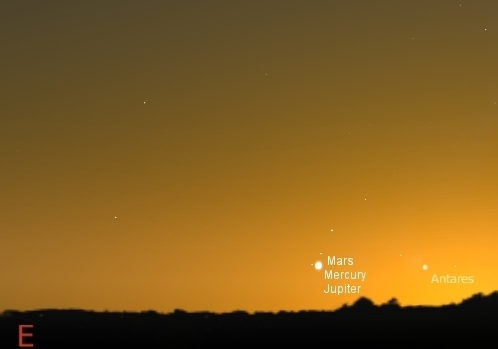 Well, I got up in time to see the rare triple massing of Mars, Jupiter and Mercury.... and all I saw was cloud. I tried to catch a glimpse in the cracks in the cloud using binoculars, but nothing. Went back to bed. From the Ice in Space forums, it looks like everyone else has had the same problem. Victorians especially, who have the added problem of smoke from raging bushfires (or the raging bushfires themselves, it is hard to concentrate on astronomy when your home and life is in potential danger - to give an idea of the scale of the fire and smoke, the United Kindom fits into the continetal landmass shown). The weather forecast is somewhat disappointing for tomorrow morning, unless you are threatened by bushfires, where the cloud cover and cooler weather may give them a much needed reprieve. Tuesday morning may have better prospects for astronomy, lets hope that the fires are under control by then. 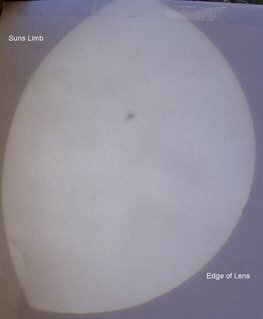 Sunspot 930 near the Solar Limb (click to enlarge). The important thing to remember, if you have a Safe Solar projection system that is mostly made up of sticky tape (even if it is industrial strength gaffer tape), don't use it on a 41°C day. I neglected that simple rule, as a result my rig tended to fall apart just as I was lining up a shot. Even when the stayed in one place long enough, my shots are disappointing to say the least. The spot was very clear and sharp, with good detail in the penumbra. The image, as you can see, is quite muddy and blurry. Part of this is due to the wind shaking the scope, and part is the inability of the camera to properly focus on the relatively low contrast image. Next time, I'm going to draw a black cross in the center for the camera to focus on. I'm also going to the hardware store to pick up some flat wooden stips (why did I assemble this out of round dowl, for crikey's sake!) drill some holes and screw them solidly onto the scope support. That should take care of most of the mounting issues. Sunspot 930 has gone all quiet, after tantalizing us with major solar flares, it has stabilized and is unlikley to erupt in the near future. There have been no further reports of aurora either. Try following Sunspot 930 on the CSU remote telescope. Voting has been enabled for the Weblog Awards (yes, I am only 48 hours behind, but humor me okay). The rules are strange, you are allowed to yote one every 24 hours until the voting period closes. Anyway, in the Best Science Blog catgeory, The Bad Astronomer and Pharyngula are duking it out for top position, leaving Panda's Thumb in the dust. BA and Pharyngula are engaing in an invertebrate vs vertebrate propaganda war to garner votes. Be that as it may, I encourage youto vote for your favoorite Science Blog, regardless of the nature of calcium disposition. The Best Australian or NewZeland Blog currently has All Men Are Liars as leading blog by a long shot. Why, I don't know, unless it is due to it being part of a large, well known Newspaper. On the otherhand, global waming denier Andew Bolt's weblog is part of a large well known Newspaper as well, and he isn't doing anywhere near as well. When Sunspot 930 blasted off an X 6 flare recently, it set off a shockwave that washed across the Sun like a Tsunami. 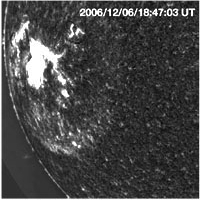 the OSPAN telescope caught it, and the NSO site there is a nice series of shots, and an animation of the wave rolling over the Sun, together with a very nice explanation. 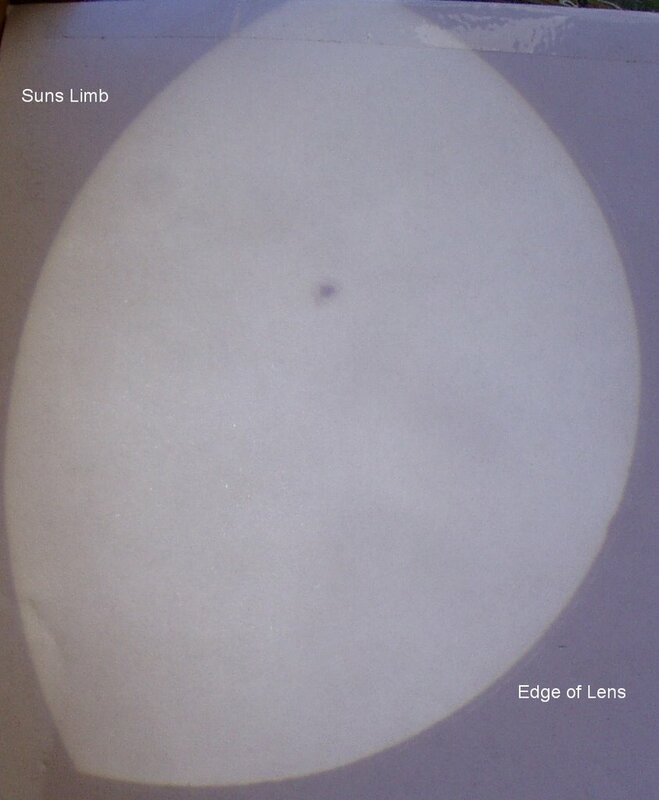 Sunspot 930 is easily seen with safe solar projection methods, why not have a look. Geomagntic activity is, well, active, so be alert for the possibility of aurora this weekend. The far north has seen some aurora, so head over the the Spaceweather Gallery for some nice shots. If you are up in the early morning looking for aurora, don't forget to check out the Jupiter Mercury Mars massing (Conversely, if you are up for the massing, get up a little earlier and look for some aurora). Carols at the academy, on stage, the carol singers are doing a upbeat vesion of "Little Drummer Boy", the lawn is a sea of candle light, on the horizon, Orions belt and Sirius glitter. Then over the stage an ISS flare bursts into view. Later, of course, this is upstaged by Elvis and Santa doing a duet, and it does fell a bit strange signing about dashing through the snow when it's been a 40 deg C day. 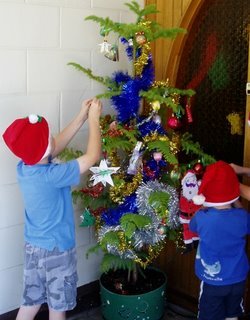 But that's Christmas in Oz. Justa quickie. 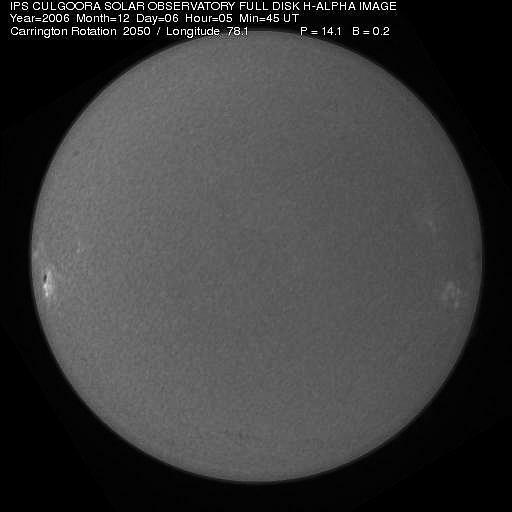 Sunspot 930 fired off more M class flares, and a protpn shock fromt just hit, so a CME amy follow. Could be aurora visible in the high latitudes of the Southern and Northern hmispheres this weekend. 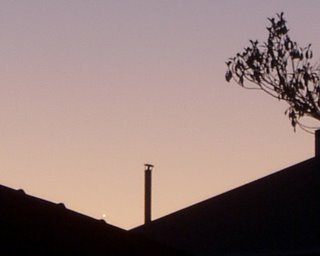 The eastern horizon, as seen in the Southern hemisphere, half an hour before Sunrise (clcick to enlarge). 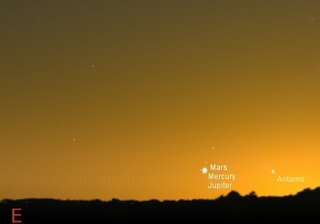 On the mornings of Sunday 10 to Tuesday 12 December , observers can see a rare triple massing of Jupiter, Mars and Mercury close to the eastern horizon half an hour before Sunrise. The planets will be so close that you can cover them all with your outstretched thumb. You may need binoculars to see them all though (Mars is faint and Mercury and Jupiter are very close). 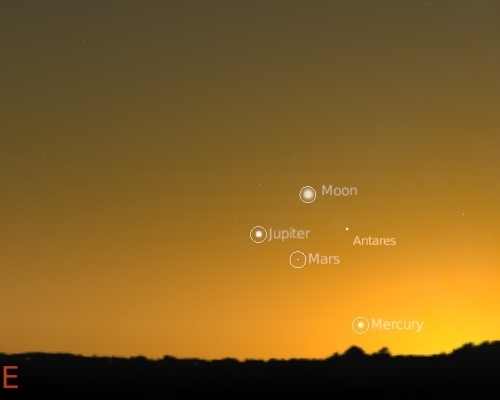 On the morning of the 11th, the three planets will be closest together. 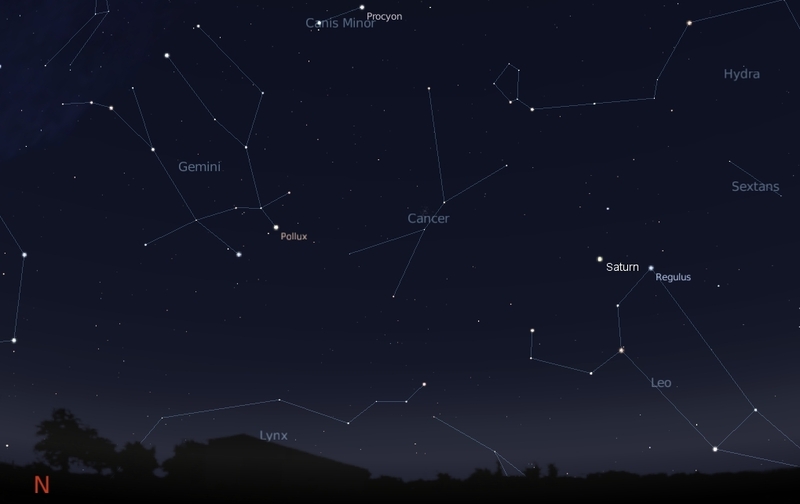 As well Saturn, the Moon and Regulus, the brightest star in Leo, form an attractive triangle. This is better seen earlier on in the morning (around 3:00 am). You may also see some Geminids, this meteor shower peaks on the evening of the 14th, spilling over into the morning of the 15th. However, some meteors can be seen in the early morning of the 11th and 12th, as you wait for the three planets to rise. The radiant is in Gemini, in the northeast. 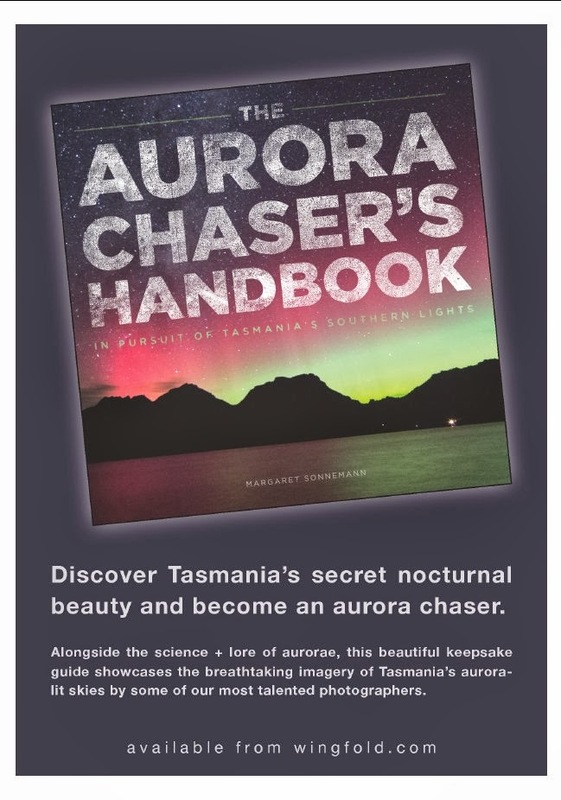 There may even be an aurora for Tasmanians and New Zealanders to see, if the most recent flare from Sunspot 930 brushes past the Earth. 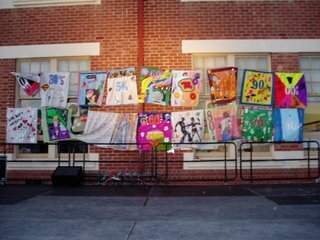 Tonight was the End of Year carnival at the kids school. There was music and dancing of all sorts. Sausages were carbonised, and parents and siblings sat rapt (well, most siblings, SmallestOne pogo danced) while the kids performed. And performed well they did. Eldest one narated some music scenarios, where his class mates pretended to be in Ben Hur, or Cowboy movies, or in one case Elvis supported by the year ones as hound dogs. 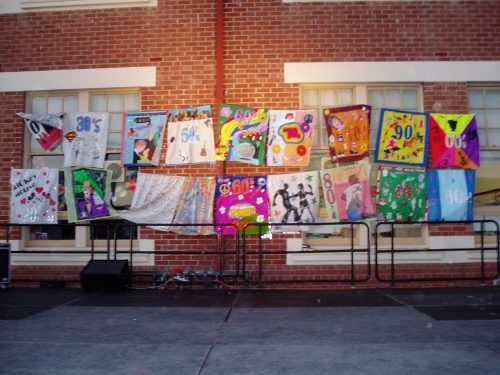 Middle one was supposed to be in the conga dance, but his shyness overwhelmed him and he hid away (sigh). But it was a great night. Pop over to New Scientist for their hot news item on what appears to be evidence of liquid water on Mars in the last 5 years! Then go to the Bad Astronomer for his take on this. And finally, go to the original press release. This is very exciting, but still not definitive evidence for contemporary water on Mars. The Weblog Awards Finialists have been announced. Nominated for best science blog is Pandas Thumb (which I write for occasionally) and the Bad Astronomy Blog. Talk about being conflicted. The Polls will be opening soon, so I encourage you to vote. (on the donside, right wing ranter and global warming denialist Andrew Bolt is in for best australian blog AHHRRGGG!!!). Sunspot group 930 has rotated on the face of the Sun. It is big enough to see with safe solar observing technques. It (not Sunspot 929 as I previously reported) unleashed an X and M class flare yesterday. It also unleased a M 1.4 and M 6.1 flare again today. Still not pointed our way yet, but if this keeps up we may have an aurora event in our near future. UPDATE: another flare, X 6.5 this time, lets keep fingers crossed for aurora. The IPS still has a prediction of minor geomagnetic storms for the 7th. The Solar Wind Speed is hovering around minor storm levels at the moment. The just past full Moon will make observing things difficult, but Tasmanians and New Zealanders should have a look in the early morning or late evening. The day started out with a committe meeting. Boring you say, but we got funding for scholarships for three honours students in the School. Yay! After the meeting, the chemists came over and installed the long awaited new filters in the fancy spectrophorometer, as I write there is a test run happening, and an new exciting experimental chapter is about to happen. Yay! Then I found out that the PhD student of my genetics collaborator has had a review published in a major journal. Yay! Thinking about papers, I'm a middle ranking academic, working in an unfashionable area of science, wedged in between teaching and committe commitments, and whose generous funding from the Brain Foundation is small change to the Discovery Institute (or even any US funding source), and I still manage to produce more papers in a year that the ID crowd have in 10. Aurora watch, Thursday 7 Dec. The Sun just blasted off an X9.0 x-ray flare, This is a serious flare, and follows up a M1.4 flare earlier. The flare was probably pointed away from us (it hasn't shown up on the near realtime images yet (UPDATE! 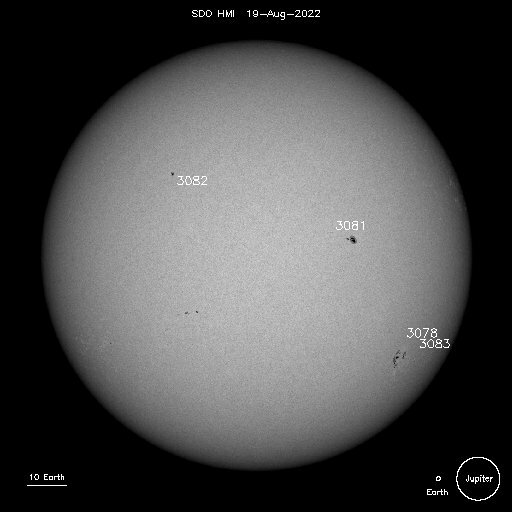 It came from Sunspot group 929 on the Suns edge, so it is not going anywhere near us)), so it is unlikely that we will get any activity from this, as big as it was, but it possible that more flares are coming our way. Be that as it may, a coronal hole may begin to affect Earth's magnetic field within the next 24 hours. The IPS predicts the possibility of minor storms on Thursday 7 Dec. It may be possible that some dark-sky mid latitude sites will see periods of minor auroral activity in the late Thursday night or early Thursday morning. You may ask, why, since I got back on Friday, have I not been posting about all the fabulous things that have been happening in space? Well, first there was sleep, and then more sleep (that was one heck of a conference), then finishing of Southern Skywatch and the ABC stuff. And playing with the kids. First I had to change the batteries on the Ai2 (this is not as eay as it sounds, as you have to dissasemble some sensors to get to the battery compartment). And then we had to build and lauch a rocket. 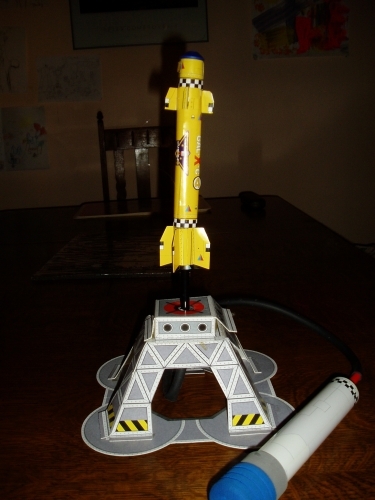 This is rocket 3 from the DK Ultimate Rocket Kit. It's a three stager, made of foam and paper and powered by air. The top section (with the upper pair of fins) detaches from the middle section (the tube all the way down to the cross hatch), to release a satellite. The top section has a sticky bit on it, so it is supposed to stick to a cardboard Moon you put on the ceiling. Unfortunately, the sticky bit is elastic, and just slides through the prepared hole. Despite this small flaw, these rockets are seriously cool, and not particularly difficult to make. If you want to keep 4 boys (three small, one big) happy for an afternoon, launching paper rockets is the thing. The December issue of Southern Skywatch is now up. It's late because of my travels to conferences (more on that later). This issue contains a rare triple massing of Jupiter, Mars and Mercury, the Geminid Meteor shower and more. 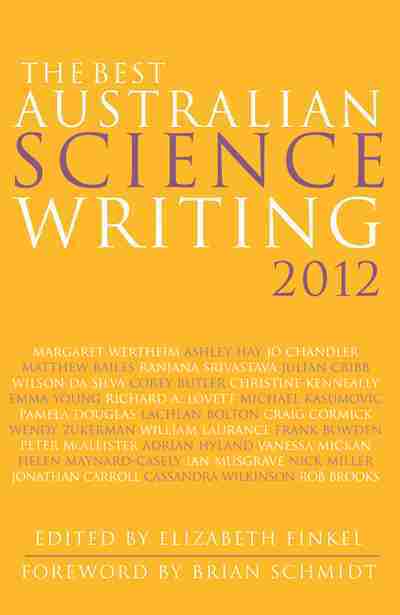 Sky&Space should be out in a week or so's time, and the ABC's online science should have a guide to the Summer Sky up next week (with contributions from Yours Truly).